Good: Colorful and creative card designs, glossy base cards have great action, team collectors will love the Generations and Triple Threat inserts, checklist has 150 rookies including 50 Rookie Class Letterman Autographs, at least one rookie card per pack. Bad: Base card backs do not have a player biography or many statistics, horizontal layout, takes more than one box to complete the base set, Proof Parallel cards are hard to spot since the only difference is a small rainbow foil on the surface of the card. I had to go through the box twice since I thought I was shorted a few. 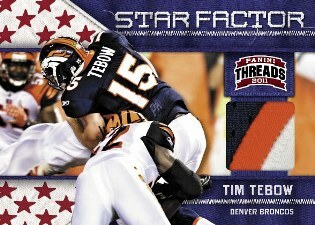 The Bottom Line: 2011 Panini Threads is a mid-level football product that costs around $75 per box. You are guaranteed four hits per box including at least one autograph. This product gives collectors a chance to pull Rookie Letterman Autographs and memorabilia cards of some of the top NFL rookies including Cam Newton, A.J. Green, Jake Locker, Julio Jones, Mark Ingram and more. I like the photography and action shots used on the base cards. Some products use overcrowded shots or awkward angles, but 2011 Panini Threads gets it right. The base cards have a glossy surface with the team colors to the right side of the card. Card backs lack player information and statistics. The Proof Parallel cards are kind of hard to distinguish from the regular base cards. Insert range from the basic-looking Heritage Collection and Star Factor to the colorful and appealing All-Rookie Team, Generations, Gridiron Kings and Triple Threat. The Generations and Gridiron Kings are my two favorites. Memorabilia cards parallel the insert card designs with a jersey swatch attached to them. The Rookie Class cards have a manufactured letter patch that is signed in blue ink. The checklist has 150 base cards, 100 common rookie cards and 50 Rookie Class Letterman Autographs. The 50 most desirable rookies are in the Rookie Class Letterman Autograph set, including Cam Newton, A.J. Green, Jake Locker, Julio Jones and Mark Ingram. Each hobby box has 24 packs with eight cards per pack. You are guaranteed four hits per box with at least one autograph. Not bad for an affordable mid-range release. The main selling point, as with most products, is the rookies. If you are lucky enough to pull one of the top rookies, the box pays for itself. It is a risk worth taking to pull one of the main Rookie Class Letterman Autographs. There are enough nice looking card designs in this product to appeal to various collectors. Team collectors will no doubt love the Generations and Triple Threat inserts. Panini even included former NFL greats Barry Sanders and Terrell Davis in their Heritage Collection insert set and memorabilia counterpart. Whenever I open a box of cards, the excitement is always there as I anticipate if the pack in my hand is the one with the hit in it. I think most collectors will feel the same way when they search for that Cam Newton rookie autograph in this product. 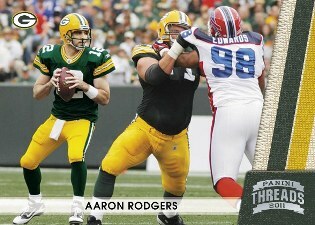 2011 Panini Threads Football promises collectors a wide variety cards in every box. With 24 rookie cards, four hits and 13 additional inserts and parallels per box, 2011 Threads offers solid value for a mid-range product. One rookie card per pack. Base set includes top names from the 2011 NFL Draft including Cam Newton, A.J. Green, Julio Jones, Jake Locker, Christian Ponder, Jonathan Baldwin, Mark Ingram and more. Four hits per box, at least one of which is an autograph. Autographed Rookie Class Nameplates (/499 or less). Gridiron Kings Signature Materials (/25 or less). 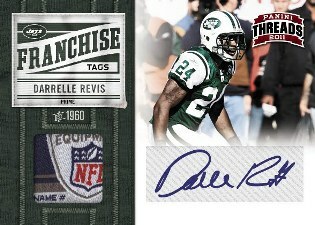 Franchise Fabrics Signatures Materials (/10 or less). Each case promises six autographs from the following list: Peyton Manning, Drew Brees, Tom Brady, Aaron Rodgers, Adrian Peterson, Cam Newton, A.J. Green, Julio Jones, Jake Locker, Blaine Gabbert, Christian Ponder, Jonathan Baldwin, Mark Ingram, Andy Dalton, Colin Kaepernick, Ryan Williams, Mikel LeShoure and Daniel Thomas. Insert sets include Generations, Star Factor, Heritage Collection, Triple Threat, Pro Gridiron Kings and 2010 All Rookie Team. 2011 PANINI THREADS FACTORY SEALED FOOTBALL HOBBY BOX KAEPERNICK ROOKIE ?? ?